The Knock Out rose I planted last summer used to be a puny little thing. Well, it seems to like the sheltered spot next to the house. The salvias are holding their own. Since roses like good airflow, I have been very diligent about keeping everything all trimmed up. This little rose may just steal my heart away from my beloved hydrangeas! Ok, probably not....but they can't all be my favorite! Its looks great! So lush and vibrant. i love that they have flowers all spring/summer, but i didn't know they would get so big when i planted them and now the entire flower bed looks so crowded. you did a much nicer job than me! I planted a few of those this year and so far they are doing really well. I think I need a couple more out front but the pickings are getting slim at the garden centers. I think the word got about these little treats! Beautiful! Are the purple flowers the salvias. I love knock-out roses. They are just so hardy and seem to bloom forever! Your gardens are looking fabulous! Ah, Knock Out Roses. We planted some and they are now four feet tall and four feet wide... and we trim them every 6 weeks! I can't seem to stop them from growing no matter what I do. I have to spray them for insects (or else they'd be covered in holes), otherwise, they grow out of control. Don't be surprised if you end up having to move them. Mine bloomed until Halloween last year (I live in Delaware, so it's a little warmer than WI). Wow! My two knockout roses got rabbitfied and I am still so sad about it. Yours looks so pretty! Knockout roses are the bomb - we finally got some this spring and I'm hooked! very nice! so this makes up for the japanese maple and the mums? maybe? at least you can say you're having some great successes in the garden. 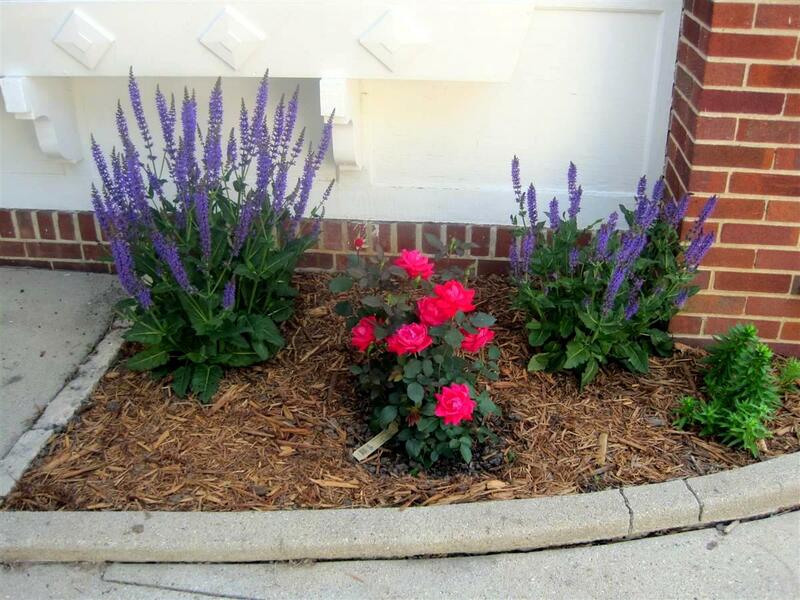 The roses and salvias look so good together!! Some people look down on the Knock outs compared to English roses, but I love the mass of flowers and extended blooming. Don't be surprised if that guy get much bigger! They will take off with the quickness. I really like this rose, never seen them before. I like that they are more like a bush than mine. I'm a big fan of the salvia next to them, too. I love my salvia but our yard bunnies love them, too. They always smash them and hang out there.